NOTE: Access codes need to be entered exactly as they appear and are case-sensitive. IMPORTANT: When purchasing this printed access card for Calculus, ensure that you are using it in a Calculus course. Use with a different course may cause complications with access. 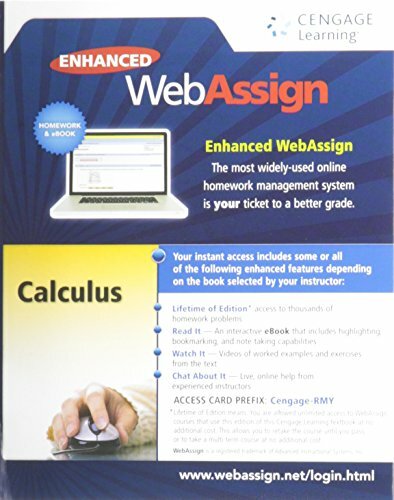 Exclusively from Cengage Learning, Enhanced WebAssign combines exceptional mathematics content with the most powerful online homework solution, WebAssign. Enhanced WebAssign engages students with immediate feedback, rich tutorial content, and an interactive, fully customizable eBook, Cengage YouBook helping students to develop a deeper conceptual understanding of their subject matter. This access code includes access to Enhanced WebAssign and life-of-edition access to the eBook for the registered edition of that text. If your students need to retake the course and you are using the same book AND edition then they will not need to buy a new code. If you are not certain this is the correct access code for your course, please contact your Cengage Learning Consultant.